NEW YORK -- Winning four consecutive games, by any measure, makes for a pleasant week in the NBA. The past week's value to the Brooklyn Nets, though, seems to have a currency beyond a modest win streak. 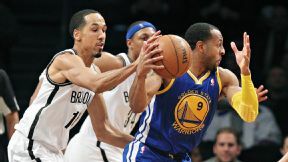 The Nets scored an impressive victory Wednesday night, breaking the Golden State Warriors' 10-game win streak with a 102-98 win. It had the symbolic value of getting the Nets into eighth place in the Eastern Conference, which really means nothing in January. More importantly, the Nets played like a more energized team than the unit that's generally gone through the season with slumped shoulders. It's not time to jump to conclusions that Brooklyn has turned a corner. It had a nice little run in December when it won four out of five games before taking another nosedive. The fact that Deron Williams just got plasma therapy on his continuing-to-be troublesome ankles and is out for a while is not wonderful news. It must be said these four victories are reasonably legit, bookended by a strong win in Oklahoma City and then this victory over the hottest team in the league. On Friday, the Nets host the Miami Heat and get them playing their fifth game in seven days in another chance to build on the streak. "It's definitely going to give us a confidence boost moving forward, and it shows what you're capable of," Nets forward Paul Pierce said. "We beat two great Western Conference teams in the matter of a week." In the first quarter, the Warriors leapt to a 16-point lead. There's a few reasons they were a perfect 6-0 on this Eastern Conference road trip before Wednesday and one of them is their shooting is just hard to brace for. For East teams that don't see the Warriors as much, it can be a little disorienting to see Stephen Curry peel off a pick and launch a shot from 26 feet, as he did in the opening moments of the first quarter. And make it. You know what the scouting report says, but it's not until Klay Thompson has burned you for a couple of triples when you're not totally on top of your defensive rotations that you actually get it. It must feel like a major leaguer who gets called up and sees a Mariano Rivera cutter for the first time -- it can stun you. Teams in the West, conversely, are rarely ready for the defensive speed of the Heat, and it's a big reason the two-time champs recently had a 19-game winning streak against the stronger conference. Now, the Nets have 10 losses already this season by 14 points or more. They have not exactly been resilient every night. So to see them not mope when the Warriors shot 65 percent and made six 3-pointers in the first quarter shows something. By halftime, the Nets had a seven-point lead. If nothing else, they are showing a better belief than they did during their recent stretch in December when they lost six of seven games, hearing whispers regarding Jason Kidd's job status. They won the game truly because Kevin Garnett was fantastic in the fourth quarter, coming up with a big block, a vital steal after excellent help defense to deny Curry a potential tying 3-point attempt and two clutch free throws. Garnett has looked more like himself lately, and it's really helped the cause. So has getting Andrei Kirilenko back from a back injury. His presence on the second unit was a major reason the Nets won. "Going into the new year, we said we obviously wanted to change this thing," Garnett said. "We haven't just been talking about it, but coming out and giving a valiant effort." Warriors coach Mark Jackson rode his starters hard. Curry and Thompson didn't come out of the game in the second half despite the Warriors' playing on the second night of a back-to-back. At the end of the game, there was no doubt the Warriors looked dead-legged and had trouble executing. This was especially true for Curry, who was just 2-of-10 on 3-pointers. He still had 34 points because he's an offensive wizard, but this loss can partially be blamed on the schedule. More honestly, it's the reason the Warriors have been linked to both Andre Miller and Kirk Hinrich in trade rumors over the past week. They could use some help off the bench at one of the guard spots. They don't have much to offer in the way of a trade, having used so many assets to work a sign-and-trade for Andre Iguodala last summer. They are clearly interested in teams looking to move a guard, as the Nuggets certainly are with the disgruntled Miller. After the game, Jackson said the bench has been playing well and pointed to the win streak. But his actions on not using his bench spoke louder than words. The Warriors wanted the game badly. They were trying to become the first team to sweep a seven-game road trip in NBA history and looking to tie their franchise record with an 11th straight win. The last time they had won 10 in a row, Al Attles was leading the 1975-76 team. The team was very aware of those two historic points, and it led to a quite downtrodden locker room afterward. When Curry was asked if fatigue was a factor in the loss, David Lee answered for him, mumbling: "We have played seven games in 10 days." Actually, it was seven in 11 days, but the point was well taken. The Warriors started this road trip in 2013, spent New Year's in Orlando, knocked off the Heat in Miami and finished with a tough back-to-back when they lost an hour by flying to New York from Milwaukee in the middle of the night. They went home having playing eight more road game than home games at this point in the schedule, so they have a friendly stretch coming up. That and this two-week feast on the East has them right back in position in the competitive West, their 13-12 start now mostly forgotten. "We gained ground in the West, you've got to win road games to stay above water," Curry said. "Obviously, all the attention was on the streak. Maybe tomorrow we can look at the big picture and realize we can capitalize on a home-heavy schedule." MVP: James Harden. Ho-hum, just an All-Star shooting guard doing All-Star shooting guard things: 38 points, five steals, four rebounds, four assists and one turnover. Harden scored 17 points on 10 shots in the third quarter. LVP: After opening the game with a slick bounce pass to a cutting Jodie Meeks, Kendall Marshall fell apart. He finished 2-for-13 from the floor and had one more turnover (six) than points. X factor: Los Angeles turned the ball over 18 times on the night, with seven huge ones seemingly coming on consecutive plays in the third quarter. Houston tallied zero turnovers in the third quarter, turning a five-point halftime deficit into a 33-15 romp. MVP: The Pelicans went on a 21-4 run to cut the Wizards' lead to six with three minutes left, but Trevor Ariza responded with a dagger 3 to effectively put the game away. Ariza hit big shots like that all night, as he poured in 21 points to help defeat the team that traded him just 18 months ago. LVP: Jrue Holiday was a nonfactor tonight, scoring just eight points and adding three assists in a matchup against John Wall. It has been a trend of late for Holiday, as he is averaging just fewer than seven points per game in his past three. X factor: Jan Vesely was a spark off the bench tonight, scoring 12 points on eight shots while pulling down seven rebounds in just 23 minutes. He ran the floor effectively and even showed a bit of a post-up game, and was a huge reason why the Wizards went on a key 19-4 run early in the second quarter. MVP: For the sake of sentimentality, Kevin Garnett gets the honors. The Big Ticket punched 11 points in the crucial fourth quarter. He also chipped in five rebounds and four big steals. Defining moment: With 4:07 left in the game, the Warriors held a slim 93-89 lead. From that moment until the 0:09 mark, the Nets went on a methodical 9-0 run to take a 98-93 lead over the dazed Warriors. That was ... deflating. The exciting game's last few moments came to a ho-hum conclusion. After a harrowing sequence of events, Steph Curry made a foot-on-the-line jumper with five seconds remaining. Referees reviewed the easy-to-decide play for what seemed like an eternity and vaporized the game's electric energy in the process. MVP: The Macedonian rookie Pero Antic, who scored 16 points and grabbed four rebounds. His early start was key, in which he paced Atlanta's 10-0 run at the beginning of the game with two 3s and a layup. LVP: Roy Hibbert, who was pushed around by Antic and Elton Brand down low. Hibbert had only two points and four boards and finished with a team-worst minus-21 rating. That was ... surprising: The Hawks' winning was a big surprise, especially playing without Al Horford and coming off four straight losses. Atlanta also looked like the dominant defensive team, holding Indy to 40 percent shooting and forcing 16 turnovers. MVP: The Raptors starters. The five-man combo of Terrence Ross, Amir Johnson, Jonas Valanciunas, DeMar DeRozan and Kyle Lowry poured in a combined 83 points. Lowry led the way with 21 points on just nine shots. Turning point: The third quarter. The Raptors outscored the Pistons by a score of 34-20 and never looked back. That was ... bricktastic: The Pistons shot 19-of-35 from the free throw line. Conversely, the Raptors hit 31 of 34 free throw attempts. MVP: Tony Parker destroyed Dallas, pouring in 25 points and seven assists. Minus Shawn Marion, the Mavericks opted to go under screens and Parker made them pay, particularly in the third quarter, when he connected on all five of his shots. Defining moment: The 15-5 run by the Spurs to end the third put the Mavericks on their heels. Dallas had managed to stay within a dozen points for most of the game, but opening the lead up to 20 essentially ended the game. X factor: After shooting 1-of-7 from beyond the arc in the first half, the Spurs caught fire in the second, hitting 8-of-13 from deep. Of the San Antonio 3-point makes, all but two came from bench contributors. James Harden, Rockets: The Beard has been fearsome recently, his latest spree coming in a 112-99 win over the Lakers. Harden had 38 points with five steals. In two previous games, he dropped 37 on the Knicks and 38 on the Kings. The fourth game in five days might have taken its toll on the big guy. Outplayed by rookie Pero Antic, Hibbert finished with two points and four rebounds in a 97-87 loss in Atlanta. "I'm not happy about this because he was warned, he comes back and he makes the same mistake, and it's not right." -- Knicks coach Mike Woodson, on J.R. Smith's penchant for trying to untie opponents' shoes. 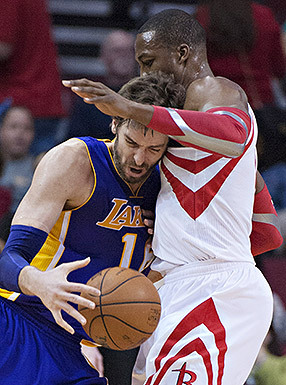 George Bridges/Getty Images Pau Gasol and the Lakers couldn't get past Dwight Howard this time, despite a Hack-A-Howard approach that saw D12 finish 10-of-24 from the free throw line. Nicolas Batum scored 14 points, handed out 14 assists and grabbed ten rebounds to help the Trail Blazers beat the Magic. It was the 15th triple-double in the NBA this season, two of which belong to Batum. Lance Stephenson (three) and Stephen Curry (two) are the only other players with more than one such game. It was the fourth triple-double of Batum's career, the most for a Portland player since Clyde Drexler recorded a franchise record 18 triple-doubles from 1985 to 1991. MVP: Blake Griffin flirted with a triple-double for most of the second half, scoring 29 points, grabbing six rebounds and dishing out eight assists. Whenever the Clippers needed a basket to quell a Celtics rally, Griffin had the answer. Defining moment: Griffin caught a bounce pass from Jamal Crawford, took off from behind the dotted line in the paint and Mozgovd nemesis Kris Humphries. Easily the dunk of the year. X factor: The Clippers outscored the Celtics 24-5 in fast-break points. Boston struggled taking care of the ball (18 turnovers), which allowed L.A. to get out in transition and incite Lob Citys usual theatrics. MVP: Gerald Green. With 3.9 seconds remaining, Green got the ball on the right wing and faded right, hitting a shot that put Phoenix on top 104-103. Kevin Martins last-second layup rolled out, and the arena went absolutely dead. X factor: Poor shooting. Minnesotas major offensive weapons -- Kevin Love, Martin and Nikola Pekovic -- shot just 16-for-52 from the field. Throughout the game, there were opportunities for the Wolves to grab the game and run, but they never materialized. That was ... grindy. For two teams that like to play fast and loose, this was no offensive showcase. Phoenix managed 11 fast-break points and Minnesota managed only nine while shooting poorly for much of the game. MVP: LaMarcus Aldridge (36 points, 9 rebounds, 3 blocks) was unstoppable offensively. The Magic tried single-covering Aldridge with Glen Davis, the best defender on the team, but it didn't matter. Aldridge scored seemingly at will. X factor: Nicolas Batum finished the game with his second triple-double of the season (14 points, 14 assists, 10 rebounds). He racked up seven assists in the fourth quarter alone during the Blazers' offensive onslaught. That was ... a block of the year candidate: On a fast-break midway through the fourth, Damian Lillard tried to dunk on Victor Oladipo but was denied emphatically at the rim. Oladipo cleanly swatted Lillard away in dramatic fashion and had Twitter buzzing.